U.S. 17 runs through coastal southeast Georgia and the Golden Isles region through Brunswick and Savannah. Co-signed with Georgia 25 north from the Florida state line to Savannah, the U.S. highway generally serves local traffic as it parallels I-95. U.S. 17 stays west of I-95 from Kingsland to Woodbine before looping east to Brunswick. North through Darien, the route doubled as Business Loop I-95 originally, but that route is no longer marked. Shifting west of Interstate 95 again, U.S. 17 heads to Midway, connecting with U.S. 84 to Hinesville. U.S. 17 and I-95 converge again at Richmond Hill in Bryan County. Through Savannah U.S. 17 follows Ogeechee Road from the south side suburbs to Interstate 516 and U.S. 80 (W.F. Lynes Parkway). The route was relocated to use I-516 as part of a bypass around Savannah by AASHTO on December 7, 1984. The change also affected U.S. 17 Alternate, which was realigned over SR 25 Alternate to I-516. The former lift bridge remain in operation until March 23, 2003, when it closed to make way for the final construction work on the new cable-stayed bridge nearby.2 Demolition of the old span cost $21 million.3. U.S. 17 spans the Savannah River between Savannah and Hutchinson Island along the Eugene Talmadge Bridge. 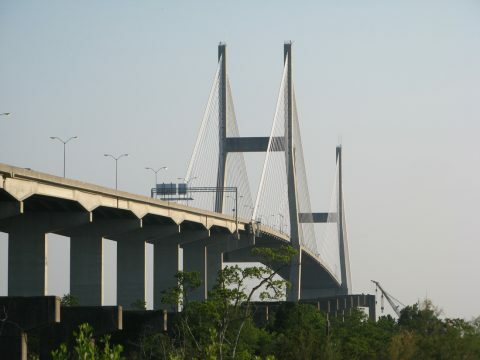 The second of two cable-stayed bridges, the Talmadge Bridge provides a high-speed route from Interstate 16 and Downtown Savannah to Hutchinson Island and Jasper County, South Carolina. Originally a two-lane cantilever bridge spanned the Savannah River between Savannah and Hutchinson Island. The bridge was also named after Eugene Talmadge, Governor of Georgia from 1933 to 1937 and again from 1941 to 1943. It opened to traffic in September 1954 after 18 months of construction at a cost of $12.5 million. Tolls collected by the Coastal Highway District until October 13, 1975 paid for the 136 foot high bridge. That bridge fee mandated that the U.S. 17 mainline remain northwest of the city to Port Wentworth and the toll-free Houlihan Bridge.6 U.S. 17 eventually was realigned to cross the Talmadge Bridge in 1988. It replaced U.S. 17 Alternate. With the need to accommodate larger vessels at the Port of Savannah, the prospect of replacing the original Talmadge Bridge grew in importance as commerce increased. Safety concerns also arose as incidents involving large ships colliding with the cantilever span occurred in July of 1983 and again in November of 1990. Trailblazers for Interstates 16 and 95 posted on Savannah Harbor Parkway west at the on-ramp for U.S. 17 & SR 404 Spur south onto the Eugene Talmadge Bridge. U.S. 17 provides a seamless connection to I-16 west ahead of I-516. Photo taken 05/29/05. The exchange joining Interstates 16 and 95 lies 10.3 miles to the southwest from Hutchinson Island. Photo taken 05/29/05. Looking southward at the Eugene Talmadge Bridge from the ramp to Savannah Harbor Parkway on Hutchinson Island. Photo taken 05/29/05. Original pier supports from the old Talmadge Bridge remain standing along the west side of the cabled-stayed bridge. The predecessor span topped out 49 feet lower than the 1991-completed bridge. Photos taken 05/29/05. The Sidney Lanier Bridge. http://www.dot.state.ga.us/specialsubjects/roadconstruction/sidney/index.shtml Georgia Department of Transportation. "Way finally to clear on new Sidney Lanier." The Florida Times-Union, April 4, 2003. "Crucial Cable-Stayed Crossing Set To Open Near Georgia Port." Engineering News-Record, March 31, 2003. "Bridge piece falls." The Florida Times-Union, June 25, 1999. "Boost to Brunswick commerce touted as new Sidney Lanier Bridge dedicated." The Florida Times-Union, April 8, 2004. GDOT - Intermodal Waterways Office - Bridges in Savannah. http://www.dot.state.ga.us/dot/plan-prog/intermodal/Waterways/savannah.shtml Georgia Department of Transportation.